Many bongs will go without this holiday season as a result of a 2,118 pound herb bust by Arizona State Troopers. The best part is how the scheming street pharmacists got this far. 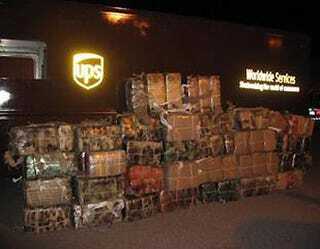 Arizona officials discovered that the drug runners were using a truck painted in UPS livery, with matching reflective yellow decals. The sticky entrepreneurs went as far as creating a homemade license plate matching that of a local real UPS truck. Total cost of the weed inside? 1.2 million dollars. The suspect fled the scene and was not apprehended. Want To Get Hassled By The Man? Fiberweed Van Air Freshener! Although this act has a stinky green tint to it, one cannot deny the ingenuity behind running packages under the guise of a package running company. Seriously, we're surprised Marlo Stanfield or Prop Joe didn't think of this first. Hat tip to Bumblebee!